RIO DE JANEIRO, Jun 20 2013 (IPS) - The bold strategy implemented by the Brazilian government has achieved an 84 percent reduction in deforestation in the Amazon rainforest in the last eight years. But when the natural resources and pesticides used in agricultural production are taken into account, the environmental progress made is not so impressive. The achievement was announced this month by leftwing Brazilian President Dilma Rousseff and her environment minister, Izabella Teixeira, in the tone of “mission almost accomplished,” Francisco Oliveira, the director of policies against deforestation in the environment ministry, told IPS. Between August 2011 and July 2012, 4,571 square kilometres in the Amazon were deforested – the lowest annual rate since the Institute of Space Research (INPE) began satellite monitoring in 1988, and 27 percent lower than in the previous 12-month period. In 2004, when an inter-ministerial plan for prevention and control of deforestation, burning and illegal logging was established in the Amazon rainforest, the annual loss was 27,772 square kilometres. Deforestation in 2012 represented an 84 percent drop since the plan’s inception, Teixeira said. Brazil’s Amazon region covers 5,033,072 square kilometres or 60 percent of the national territory, and the decline in deforestation is an essential contribution to progress towards the country’s target for reducing greenhouse gas emissions, responsible for global warming. Brazil made a voluntary commitment to reduce deforestation by 80 percent, from 1990 levels, by 2020. “We have already achieved 76 percent of this goal,” minister Teixeira said on Jun. 5. The plan was launched early in the administration of leftwing former president Luiz Inácio Lula da Silva (2003-2011), based on three inter-related core concepts: tighter control and higher penalties for illegal logging, stimulation of sustainable activities and regulation of land use. Land-use planning policies created forest conservation units totalling 250,000 square kilometres, equivalent to 75 percent of the environmentally protected areas in the world, according to official figures. Environmentalists welcomed these results, but they warned about collateral effects and future threats. “There have been setbacks in the past year, particularly after the approval of the new forest code,” Painel told IPS. The controversial code, promoted by the powerful landowning lobby, halted the decline in deforestation, “putting the Amazon region in danger again,” the activist said. The law provided an amnesty for illegal logging carried out before July 2008. This gave large agricultural and livestock producers and illegal loggers a sense of impunity, Fernando Gabeira, a former congressman for the Green Party, told IPS. “In the Amazon, they got the idea that they should carry on deforesting as fast as possible,” he said. The government and environmentalists consider that “accounts” for the Amazon should include an additional factor: the economic expansion of the country which is growing as an emerging power based on two pillars, agricultural production and mining. Brazil is one of the top exporters of soy, beef and sugar, and its goal is to become the world’s biggest food producer. China is at present the main importer of Brazilian agricultural and livestock commodities. “Deforestation is closely correlated with economic growth, and it now depends a great deal on China, which buys soy, beef and minerals. Our relationship with the Asian giant will determine much of what happens in future,” Gabeira said. 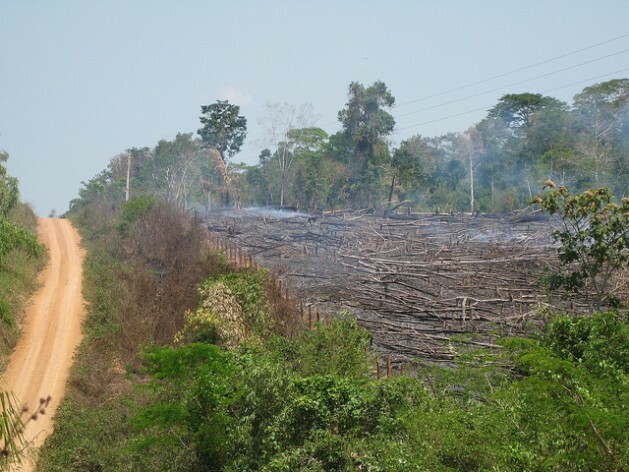 Painel said that as well as illegal logging, the expansion in the Amazon of crops like soy and of cattle ranching has a strong effect on deforestation. He added that “it is important for all the costs of agricultural production to be taken into account. The natural resources used are not counted, and more organic, sustainable production does not exist,” he complained. He also pointed out that Brazil is currently the top global consumer of pesticides, and that the country does not include costs like the water consumed by agribusiness in the accounts it keeps of its economic growth or exports. “Every kilo of exported beef requires thousands of litres of water for its production, a precious resource in today’s world,” Painel said. The “over-use” of fuels for production and overland transport to the country’s ports is not taken into account either, he said. “The accounting has to include other factors such as sustainability, social issues, benefits to the country and particularly investment in new technology to increase production with fewer natural resources and without pollutants,” he said. “We don’t have to take on the role of feeding the world. We can contribute. But it is not Brazil’s role to feed billions of Chinese hogs with soybeans,” said Painel. According to the environment ministry, areas of pasture and secondary vegetation (re-growth after land clearance) expanded by 22 percent between 2008 and 2010. Pastureland is increasingly occupying recently deforested areas. “This shows that it is possible to produce in a sustainable manner while preserving the environment, by means of sustainable agricultural practices,” Minister Teixeira said. But the government admits that in order to maintain the positive results in the Amazon, it is necessary to step up efforts to promote sustainable economic activities, which it says will now be the focus of its plan. Oliveira mentioned, for example, that vast tracts of land in the Amazon that have not been allocated could become areas for sustainable forest management, settlement of landless farmers, or production. “We have to separate the wheat from the chaff, because there are people of good faith who are working properly in the Amazon, respecting environmental laws and building a future in the right way,” he said. But unfortunately, the majority persist in illegal behaviours, he added. One positive step, the official said, is a moratorium by companies on buying soy grown on newly deforested land in the Amazon rainforest, in force since 2006 and respected by 90 percent of traders. An agreement is also in effect for meat packing plants not to buy beef from illegally deforested areas. Brazil cannot lower its guard in demonstrating that it can grow and maintain its forests, said Oliveira. In Painel’s view, to do this requires “changing the vision of agribusiness in Brazil. It has an important role in the national economy, but the direction it is taking is utterly behind the times,” he said. “The big producers want as much land as possible, so they encroach on protected conservation areas, indigenous territories, land close to river banks… they have no shame in accelerating the deforestation process as much as possible, to maximise production,” he maintained.